"A signature tee shot for The Rushcliffe with an elevated tee into a generous fairway. 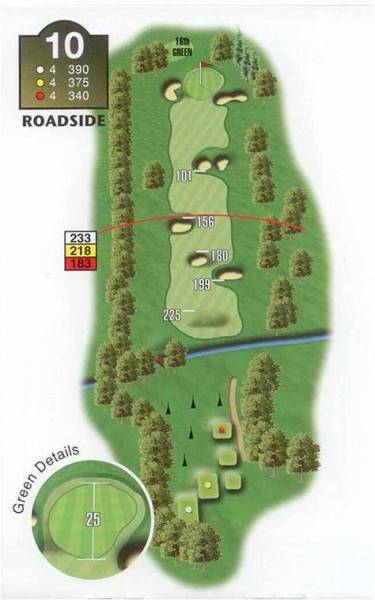 Three challenging fairway bunkers intimidate the player - from the Men's tee box they lie not far off the 'Tiger line'. For the long hitter the 'spectacles' bunkers await to swallow up an over exuberant drive, forcing the player to make a difficult long bunker shot and then get down in regulation to save par. "The green is cleverly defended with a deep bunker short right and a sloping approach, feeding into a deep left bunker. The green is small and surprisingly sloping, making birdie opportunities difficult to convert."